Much like any other type of survey, a topographic survey, or topo survey for short, is done to locate natural and man-made features on a particular parcel of land. This is sometimes called planimetric features or things you can see from a plan view as if you were hovering over the site. The topographic survey is different in that the elevation of the surface of the land is surveyed and represented on the resulting map of the survey. The topographic survey usually also includes any man-made underground features, like utility lines. The topographic survey will also show above ground improvements like buildings, utility poles, retaining walls, etc. The elevation or differences in elevation on the surface is usually shown as contours. A contour line is a line that connects points of equal elevation. There is usually a contour interval set, say 1-foot for conventional survey. An aerial topographic survey may have a contour interval of 2-foot to 5-foot typically. Atnin, these contours are a way to represent the relative elevations of the surface of the land. By industry standards, contour lines are accurate to within half the contour interval. So, a 1-foot contour line should be within a half foot (0.5’) of the actual elevation on the ground. Some topo survey also supplement the contours with spot elevations at certain important points. Depending on the purpose of the survey, these spot elevations may be accurate to a tenth of a foot (0.1’) or even a hundredth of a foot (0.01’) of the actual elevation. What is the purpose of a Topographic Survey? Topographic survey is usually carried out in order to have an accurate record of the existing conditions of a parcel of land that is about to undergo some type of construction activity. Design Engineers use a topographic survey as the beginning surface of their design and then plan what the proposed final surface will be like. Having this original surface allows the Engineer to calculate the amount of earthwork that might be needed to bring the site to the final grade. The Engineer can also balance the earthwork so that dirt need not be taken off the site or brought onto the site. An Architect uses the topographic survey in a similar way, but may also plot the surface in three-dimensions to get an idea of the finished look of the site with the improvements. This may be used in a presentation to the owner of the land, or the public in a public meeting before design and or construction of a municipal or government building. Many times a topographic survey is very helpful on a severely limited site. The site might be limited by extreme terrain (steep slopes) by existing features or adjacent structures. A precise topgraphic survey will insure the designed improvement will fit on the site within those limitations. How is a Topographic Survey done? A conventional survey is done by land surveyors on the surface of the land, usually with an instrument called a total station. Some surveyors now may also use a survey grade GPS unit to do this type work. Either way, this is somewhat manual work. A surveyor walks the entire site taking shots (horizontal location and elevation) at a specific interval in order to meet the project accuracy requirements. For example, a 1-foot contour topographic survey might require shots at a 20-30 foot interval and also shots along all breaklines. A breakline is a point at which the contour changes abruptly, like the back of a curb, or the center line of a roadway. An aerial topographic survey is done from aerial photos taken from an airplane or helicopter at a certain distance above the ground. The aerial photos are then viewed together to form a stereo pair that allows the mapper to “visualize” the ground surface. Looking at two overlapping aerial photos to see the ground surface is exactly the way we have depth perception using both our eyes. The same point is seen from two different vantage points. From this, our brain can perceive the relative distance away from our eyes. With only one photo, or one eye open, you cannot perceive depth. A conventional survey is typically used when the contour interval and spot elevations must be precise. The aerial mapping process is more limited in accuracy on both the horizontal and vertical location of points on the surface. A 1-foot contour is about the limit for aerial work and spot elevations may be accurate to only a half-foot. So, this type survey is not acceptable for designing something like a sanitary sewer main that might need to be within ±0.02’. While these are somewhat simplistic explanations of the methods for doing a topographic survey, you can get much more information online. The purpose of this explanation is to give an overview. What does a completed Topographic Survey look like? 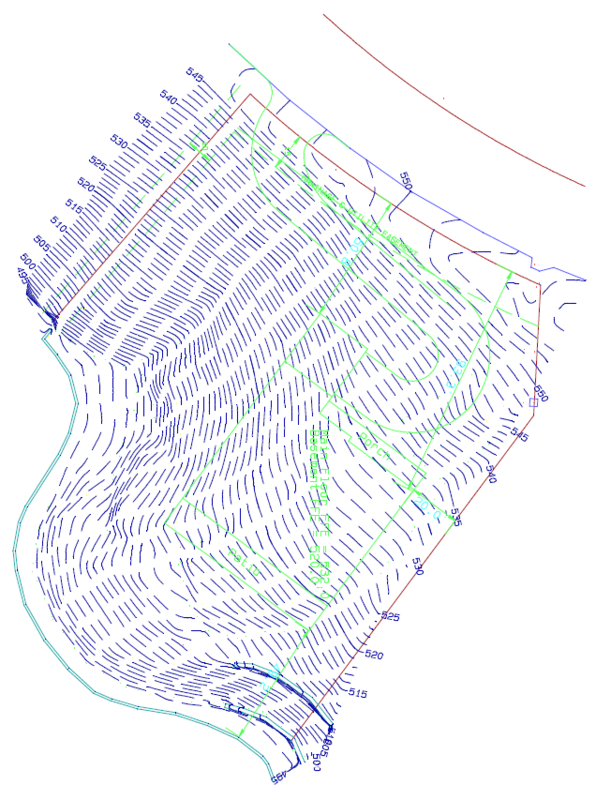 The final product from a topographic survey is a map with all of the required features shown along with the contours representing elevations. An electronic map may also be supplied to an Engineer and/or Architect for their use in further design. The electronic file will have all the spot shots and breaklines included in order for a digital terrain model (DTM) to be developed. All of these breaklines and spot shots might not be represented on the printed version of the topo map. Call ​Jasper n Land Surveying today at (423) 301-8001 or fill out our contact form for more information concerning your topo survey or topographic surveying needs.